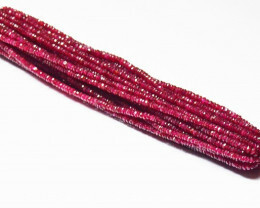 6 line natural Ruby 2mm - 3mm Gemstone beads RUB001 Sale is for one six inch lines of ruby listed. 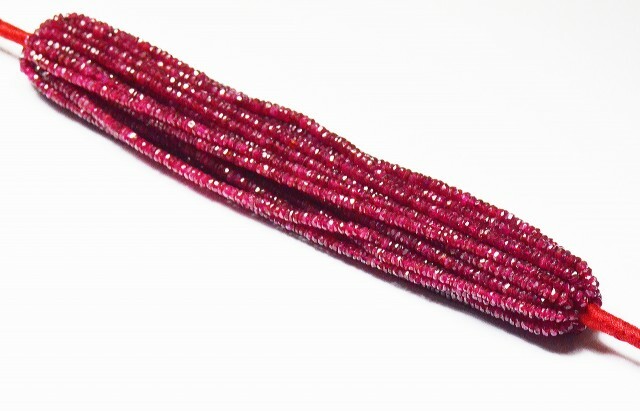 These Burmese Ruby beads are sensational. The color is a delicious shade of deep ‘pigeon blood red’ which is considered the best Ruby color. 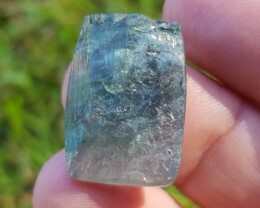 These are not glass filled Ruby, they have been routinely heated with borax which is an acceptable treatment of rubies and is akin to the oiling of Emeralds. Rubies are always heated unless they are of an exceptional price and many thousands of dollars. Genuine and natural Rubies - they are awesome. 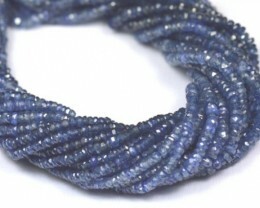 The parcel came in 6” strings so we are selling these in lots of 3” half line, 6”, 12” and 18” full necklace length. Any questions and do not hesitate to contact us. Many thanks. Ruby righteously symbolizes passion and love. The ancient Hindus call this precious gem ‘Rajnapura’ which means ‘King of Gems’ being one of the most costly stone throughout history. A magical power attributed to ruby is that of warding off evil spirits. Worn by the right owner, it can change its redness into a deeper darker hue whenever danger is approaching, and turns back to the original state when the danger is past. Ruby is a type of mineral which is a falls under the category of Corundum, the next hardest mineral following the diamond.It is formed as crystals which developed within the spaces of metamorphic rock. Needless to say, the bigger a ruby is,the more expensive it will cost because it rarely develops on big sizes. It can exude different color ranges from orange red to those with a purplish red shade. The most preferred ruby is the one with a true red color. Excellent qualities of rubies can be found in the countries of Kenya, Australia, India, Pakistan and the United States. Ruby is distinguished and known by all for its fiery red color. 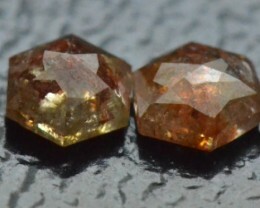 Beside for its color, it is a most desirable gem due to its hardness, durability, luster, and rarity. 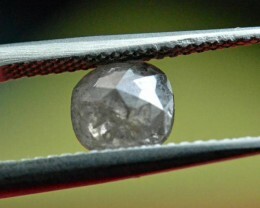 Transparent rubies of large sizes are even rarer than diamonds. Transparent,flawless rubies exceed all other gems in value. (except for deeply colored “fancy diamonds”).Rubies must be transparent to possess gem value. Opaque or semi-opaque rubies have little value, even if they display asterism. Ruby is a red variety of the mineral corundum. 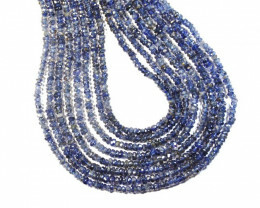 Sapphire, the other gem variety of corundum,encompasses all colors of corundum aside from red. In essence, ruby is a red sapphire, since ruby and sapphire are identical in all properties except for color. The color of ruby ranges from bright red to dark reddish-brown. The most preferred color is a deep blood red with a slightly bluish hue. Such ruby is known as “Burmese Ruby” or “Pigeon’s Blood Ruby”. Ruby from Burma is famous for its exceptional coloring. 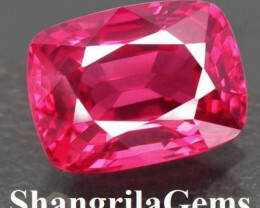 However, Burmese ruby rarely exceeds several carats,large flawless Burmese rubies can be worth millions of dollars. Most rubies on the market are from Thailand,and these rubies have a brownish hue. They can be heat-treatment to improve color. 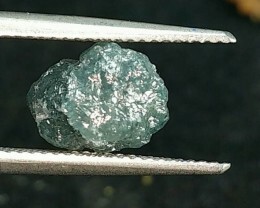 Heat-treating a ruby can also increase its transparency by removing tiny internal flaws. Ruby is the gemstone of love. Astrologers say that ruby generates liveliness and spark in human nature.It casts away despair and gloominess of character. Ruby is effective in safeguarding a person from evil spirits.Ruby enhances financial stability and assures recognition in the society. Wearing ruby can also fulfill a native’s desire of a son. According to astrological principles ruby fades or changes its color when bad things afflicts it’s native but it gradually gains its color after the bad phase. Ruby is so effective that it lessens the impact of poison and becomes pale when there is a poisonous thing near by.